Introducing Bob the bird. Named because his first people, Pete and Lizzy could not tell if “he” was a bloke or bird. He does talk in many voices and says some very interesting things. One would think that someone who has grieved the loss of a mongoose pet of 13 years, a monkey which was like a grandchild and slept in our bed, a sweet little duiker who froze to death in a freak cold spell in Zimbabwe and whose body we didn’t find in our own rather large yard for nine months in spite of searches, a house chicken and pig, numerous dogs, cats, fish, birds, frogs, tortoises, hermit crabs, hedgehogs, bush babies, snakes and chameleons would be war weary, broken hearted and…wiser. Not so! At the risk of revealing a blind spot the size of the DR Congo itself, I admit that we are now sharing our lives, our shower, our food and our furniture with Bob. 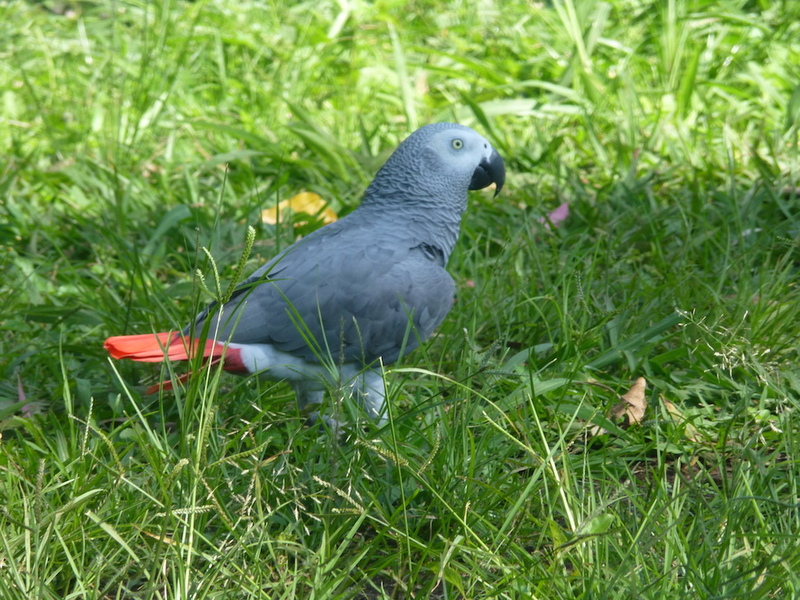 Bob is an African Grey parrot. That translates into a dapper, though wickedly wily, little man in a formal grey suit and red tails with a mercurial temper and an unreasonable trust of Jon and distrust of me. I am the one who builds and rebuilds lovely wire- and bar-free avian habitats for him, embellishing them with bits of old flip-flops to chew and providing entertaining ways for him to climb up under the rafters to spy on the world, unseen. I am the one who combs the Kenya beaches to find and bring back the choicest cuttle bones, which he will then studiously ignore rather than sharpen his beak on. I am the one who insisted he get to sleep nights on the shower rod in our en suite bathroom rather than be left to the mercy of the elements out on the verandah. I am the one who panicked when he decided to climb way up on top of our Bunia home’s dangerous razor wire and ran to rescue him. I am the one who had a heart attack when he then decided to plummet at angles anywhere from 45 degrees to straight down over the wall into an inhospitable and dangerous world full of creatures and people who didn’t realize he is a personage of value and renown, for reasons other than how he would taste over curried rice for dinner. But Bob is a delightful character and has made himself an integral part of our little family. Yes, we have long been outnumbered by our animals, which is as it should be in my opinion. We have recently moved from the Bunia town location to a lovely hilltop home in the village of Nyankunde, East DR Congo. That means that Bob and the dogs, Jack Russell “Tess” and Congolese Hunting Dog, “Mkuki”, are enjoying the opportunity to live with a wide open valley view rather than a razor wired wraparound wall. And there are so many more birds in our huge trees and abundant bushes here that Bob is learning a whole new library of songs. When he first came to live with us I began teaching him the tune most often associated with the wonderful narrated orchestral piece, Peter and the Wolf. He picks stuff up really quickly and he seems to like tunes with large intervals between the tones. Now his current fave is the opening line of the Johnny Appleseed song, “Oh, the Lord is good to me, and so I thank the Lord…” But whistled, not sung. I’d like to teach him to sing the words but we aren’t there yet. But there is a sweet side to Bob as well. His latest favorite word is, “jambo”, which means “hello” in Swahili. He will sometimes even say, “karibu”, which is welcome. 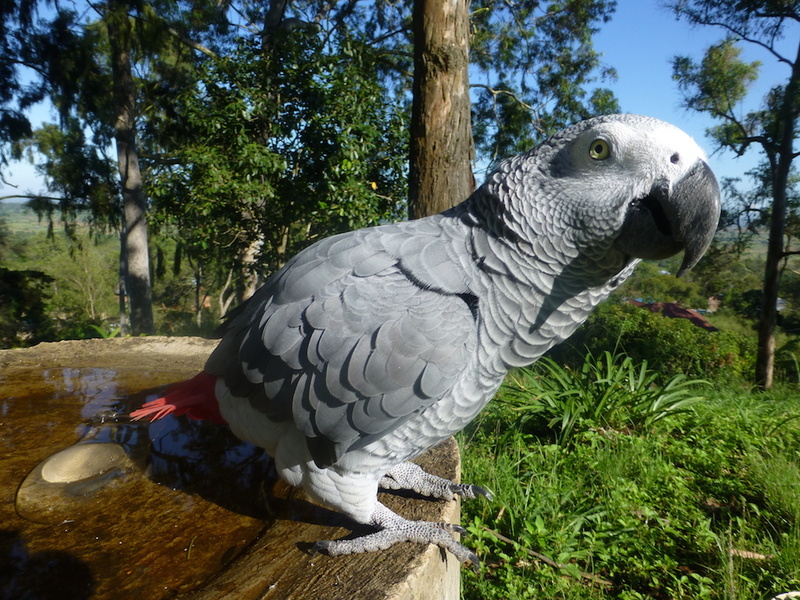 He is also a mumbler of note and if I don’t let him know I am listening I can often hear him chatting and mumbling away to himself in part English, part Swahili and part African Grey, chuckling heartily at his own jokes and bantering back and forth with his own self. Being a parrot, Bob is mischievous and he often has to try to get back into our good books with an endearing, “Love you”. But without a doubt his best proclamation ever was uttered one morning as he gazed down from his shower curtain rod bedroom at Jon sitting on the loo and coo’d, “I love you, Jon”. Bob is a cannibal whose favorite food is chicken or eggs. He’s always willing to raid your plate for these as well as to trick you into sharing your scone with him. He is just like your little brother who would ask for “just a tiny bite” of your cake and would then lunge forward at the last minute taking a huge, crumbling chunk all at once. I admit that it flatters me that Bob would rather sit in whatever room I am in for most of the day rather than be outside in our open, forested garden communing with all of nature in its beauty. That is unless Jon is home… Flattery aside, I still love watching him sit out front on the birdbath or, better still, watching him take a 20 minute thrashing bath in it. But one day, as I was rearranging his branches on the front porch, I heard him squawk loudly and turned just in time to see our neighborhood Sparrow Hawk buzz him, knocking him from the bird bath onto the ground. I thought Bob would be seriously traumatized and raced over to rescue him and take him inside. But not a bit of it. Maybe he didn’t even realize what had hit him. The next morning he strolled unconcerned back out to the birdbath to take up his post and serenade the great outdoor community with the lilting strains of Johnny Appleseed. And yes, the Lord has truly been good to Bob, and to us, in bringing us together in this beautiful place. I know exactly what my dream home looks like because I have lived in it. On my first visit to Fothergill Island on Lake Kariba I said, “Some day I’m going to live here”. A few short years later and it became our home! Lake Kariba is a man made lake above the Zambezi River dam on the border between Zimbabwe and Zambia. One of its’ signature features is the dead hardwood trees that stick up out of the water near the shores. At first I didn’t like them. They are so bare and skeletal, they seemed to ruin the beauty of the lake. But with time I grew to love their stark black silhouettes in the sunsets. Fothergill is a small island often connected to the mainland of the Matusadona National Park when the lake level is low. It has a Safari Lodge, an airstrip and a village on it as well as herds of impala and buffalo, elephants, hippos, lions, leopards, hyena, jackal, warthogs, zebra, porcupines, snakes of all sizes and toxicities and all manner of small mammals and hundreds of species of birds. The lake is full of crocodiles, tilapia and fierce fighting Tiger Fish. The owner of the safari company was a Christian man who made his Safari Camp available for church retreats, youth camps and R&R treats for missionaries. There was also a group of men from Kariba town across the lake who were doing an evangelism and church planting ministry along the lakeshore. Our positioning there made us available to help in all these outreaches. The tourist lodges were separated from the staff homes by a large, double storey dining room and the office. My dream home was on the staff side. I am afraid I won’t be able to describe to you the wonder and beauty of this house! The L-shaped central part of it was the oldest building on the entire island. The long part of the L was the living room and the short part was where we kept the dining room furniture, though we took all our meals up at the safari lodge. The walls were about waist high, of local brick made right there on the island. Placed at (fairly) regular intervals inside the walls were…trees. OK, tree trunks. The frame for the grass thatched roof was built on them. The roof was very high and steep and came down to just above the level of the walls, but extended about 6 feet out beyond them. The house was totally open air and we had an unimpeded view of the lake and surrounding bush. There were no doors on this house. Off the lakeside end of the living room we had a deck. At the end of the dining room there was a tiny “kitchen” with a sink, but no place to cook. To one side of the entry way was the bathroom. 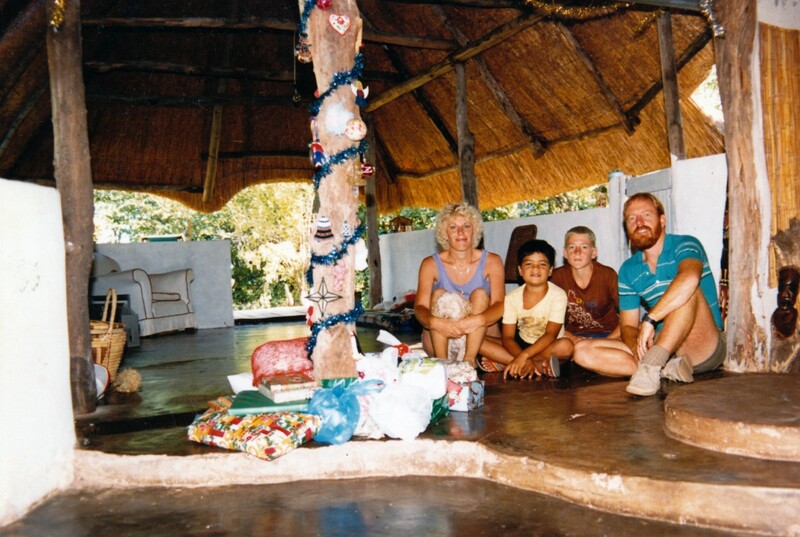 Our bedrooms were rondavels, round tin huts with tin roofs. Jon’s and mine was attached to the main house at the corner of the L but the boys’ was outside the entrance, a few steps away. On a hot summer day the temperature outside in the shade was often 115°F. Shut that heat up in a tin rondavel and you have a really huge oven. We never closed our windows and we slept on an unheated waterbed with no insulation between the sheet and the cold body of water. Try that in Oregon and you’ll have to sit in a scalding bath for over and hour to thaw your bone marrow. At Fothergill, in the dream home, we took it one step further and dipped our sheets in a bucket of water and then put them on the bed absolutely soaking wet. The evaporation helped to cool us. I say we didn’t close our windows but the truth of the matter is that this dream home employed the bush version of a labor saving device: leaving the broken window panes unreplaced. This innovation allowed us easy access to and deployment of the bricks we kept under the edge of the bed for throwing at the elephants and buffalo who delighted in using our flowerbeds, young trees and sunflowers as fast food. Sure enough, there behind the table, curled up in a corner, was a big, fat puff adder, one of the most successful man killing snakes in Africa. I, who had previously scolded Caleb for waking up the whole neighborhood, threw good manners to the wind and started shouting at Jon to wake him up. My efforts didn’t come close to the noise Caleb had earlier made and had even less impact. Pulse rate still rising, I finally had to leave the bathroom and cross through the dining room to go shake Jon awake. So what do you do with a big, dangerous snake like that in your house in the middle of the night? Jon decided to go get the BB gun and shoot it in the head. From a perch up on the wall above it, he took careful aim and shot the thing smack in the middle of the top of its’ skull. The BB bounced away. The snake didn’t even stir. Now what? So Jon lowered the gun down so the barrel rested right on the snake’s head and fired again. Still nothing! He fired again and again and eventually the BBs were stacked high enough that with the repeated pounding one penetrated its’ skull and it died. We put it outside in the laundry sink and all went back to bed. The next day we skinned the big Puff Adder and we still have the skin to this day. So my dream home wasn’t anything fancy but you know what they say; “Location, location, location”! Well, since I last wrote suggesting that I could convince you that Bruce was lovable I have been wracking my brain and, to tell you the truth, I’m finding it hard to find stuff that “regular” people might find endearing. But there really is so much. Caleb is the only one of our family who is not allergic to cats and I have been saddened that we can’t have any around. Who doesn’t love the sound of purring? Well, when Bruce joined us as a little tiny thing he purred! He could and would also give genuine hugs, around the neck or upper arm. He would really squeeze, pulling us tight and close. If we had been away longer than expected, anything from going out to dinner after church to being away for months on furlough, we would be greeted by the most amazing trilling songs when we returned. He would grab me around the neck, squeeze hard, stick his long nose deep into my ear and begin singing like a canary on steroids. It was a painfully loud but irresistible song expressing ecstatic joy at our return. 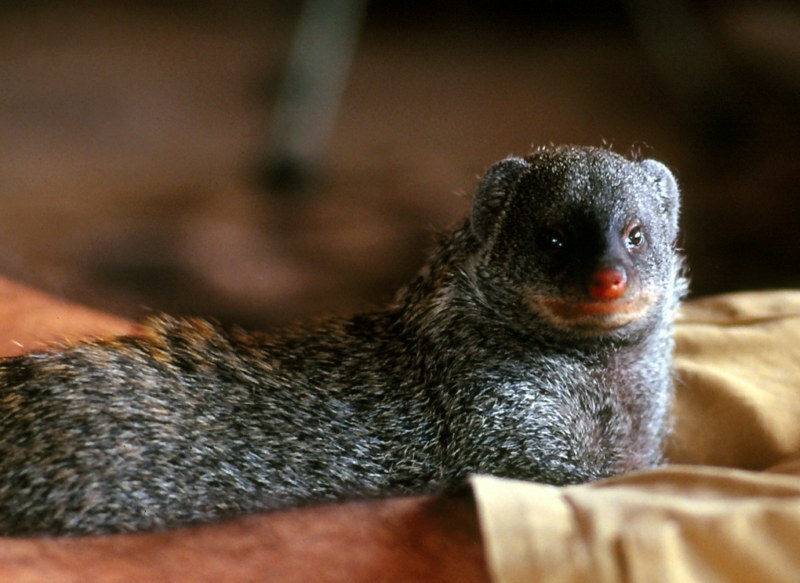 In our many years of living with Bruce we learned to understand quite a bit of the very large and well documented Mongoose language and Jon could even speak some of it! He loved to come into the kitchen when I was preparing Bruce’s supper and tease him by saying what Bruce always said in anticipation of being fed. Bruce would stand expectantly at my feet making a certain little sound and Jon would come in, stand near me and start saying the same thing. Bruce reacted instantly and violently to this competition for food. He would start screaming at Jon and attacking his feet and ankles with his sharp little teeth, sometime chasing him right out of the room. Then he would come back and hover at my feet with a dark look in his eye, watching for the interloper and ready to react in an eyeblink. Our good friend, Bill Taylor, brought friends over for to visit one day when suddenly Bruce started a loud and emphatic cackling in another room. Bill told his guests that we would know what he was talking about without even looking so we listened and then told them that he was talking about water being where it didn’t belong. We all got up and went to find Bruce and, sure enough, the maid had overwatered the ficus tree and water was running all over the floor in the entry way. Fun. Bruce had favorite friends and his very VERY favorite was Sharon, the girlfriend of one of Josh’s friends. It was a true crush. Just the sound or her name set his heart racing. One day Bruce was sound asleep on my lap when Sharon arrived so he was totally unaware of her presence. I woke him up and quietly said, “Bruce, Sharon is here”. He shot up, spun around and bolted across the room, not presuming to jump up onto her lap, but happy just to literally grovel at Sharon’s feet in abject worship, rolling around and whimpering. Bruce’s favorite food was chicken and he could steal it right off our plates right under our noses at the table! One night I was sitting at the table when suddenly there was a streak and a blur and the chicken leg was gone from my plate. One night when we were having chicken we noticed there hadn’t been any begging or Kamakazi raids on our plates so I went to look for him. I found him inside the refrigerator. He looked at me like, “Whaaaaaaat?” Wait a minute. I was supposed to be telling you the endearing stuff. Bruce loved warmth. I had many tortoises of varying sizes over the years, 42 at one point, and Bruce had a special relationship with one of the very large black ones. Her name was Humpty because she had prominent humps in her shell. Tortoises are very territorial and habitual and Humpty had a regular routine she followed each morning. You could just about set your watch by where the tortoises were in the yard at any given time. Well, Bruce liked to go along with Humpty on her morning peregrinations. She would graze her way around the yard and he would lie back against her with his little tummy turned to the sun. When she was ready to move on to the next clump of grass he would stir himself and walk alongside her till she stopped to eat and then he would prop himself back against her to enjoy his sunbathing. Humpty finished her morning circuit just in time for midmorning tea in the house and Bruce would excuse himself and come inside for his tea and biscuits. The ladies at our vet’s office in Bulawayo used to actually serve Bruce tea when we came in! One of the most entertaining things Bruce did was to hike things between his legs to break them open. Jon had heard that hiking eggs for eating access was part of their natural behavior so one day he gave him a chicken egg to see what he would do. At that time Bruce was way too small for chicken eggs but the instinct for hiking them was strong so he gave it a go. Gripping the egg in both hands he pushed it backwards and, encountering his own body blocking the egg’s way, he tipped up onto one side, scooted the egg past the other leg and then turned around to have a look at the results. Not good. No breakage. The egg was just too big to shoot through and hit the wall. So Jon gave him a small round hard white Imperial Mint, which looks very much like a bird egg, to try. He grabbed the mint in both hands, backed up to the wall in a hilarious zig zag shuffle and hiked the mint between his legs with all his might. The mint smacked the baseboard and ricocheted clear across the room in an instant. Bruce turned around to get his reward only to discover it had vanished. The look on his face was priceless as he looked around trying to figure out what had gone wrong. We gave him the mint again and he repeated his actions but this time he paid attention and noted the ricochet action of the hard candy. By about the third attempt he would hike the mint and then immediately begin a sprint across the room where he would catch it before it could hit the opposite wall. With God as my witness this was one smart animal! Do any of you out there have Bruce stories to share? I’d love to hear them. I like animals. Not just to look at or keep in the yard. I want them sharing my everyday life, sleeping in my bed, roosting on the back of the couch. It has been suggested that I should be called “Mrs. Noah”, but that doesn’t quite say it. Mrs. Noah may not have had any sympathetic feelings for all those animals her husband brought home. She may have been thinking “yacht” up till then. Me, I would have been thinking pets, friends, family members! One of my first and favorite memories of my paternal grandmother is of her excitedly moving the living room couch out from the wall to show me the brand new, pink and hairless mice nursing contentedly in the downy nest their mother had rustled up inside it. No thought about getting mice out of the house, shrieking and leaping, stuff like that. Not my Grandma. She took childlike joy in that “otherness” living right amongst us. People say she and I were cut out of the same piece of cloth, and more than once I have caught half a glimpse of myself as I passed a mirror and done a double take, seeing her looking back. But it’s not our looks they are referring to. We are kindred spirits. That soft spot didn’t skip my dad’s generation, either. Mom used to get really irritated at him because he would let the cats sleep in the clean laundry rather than put them out into a cold, winter night. Somewhere we have a picture of our big German Shorthair dog curled up on and over the edges of his lap while he read the paper. 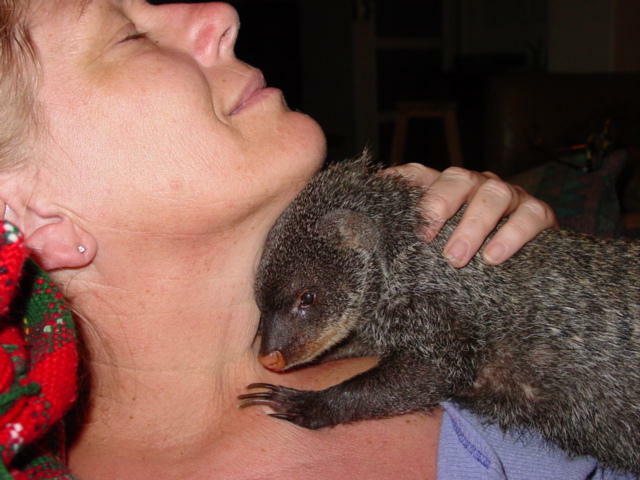 So when I met the plane and Jon said, “I brought you something” I was thrilled when a tiny, little banded mongoose leapt out of the basket and installed himself tightly in the springs under the passenger seat. Jon fished him out and we were introduced. Thus began 13 ½ years of life with an intelligent, affectionate, inquisitive cyclone named Bruce. How to describe Bruce: a salt and pepper colored mammal, bullet shaped on both ends, long claws on his front feet, soft and tiny little round ears and black stripes side to side over the back of his body. But the best part is that the hairs themselves are striped and God made the black bars by lining up the black bits of the hairs across his back! Only on that part of him! On the rest of his body, though the hairs are striped, the stripes aren’t lined up so you get that salt and pepper effect. Jon was in Quelemane, Mozambique when he spotted a small boy dragging a baby mongoose by a string tied around a grossly swollen back leg. “Hey, that kid has a mongoose!” and the driver did a U-turn right there and pulled up by the boy. Bruce was purchased for about 25 cents and Jon popped him inside his shirt and took him back to where he was staying. He had to fly the next day so he just left Bruce in his room. When he returned, all the floor moulding had been stripped off one whole side of the room. Bruce had been looking for the termites he must have smelled. That right there should have been a clue that this little thing would be trouble. Bruce was nothing if not inquisitive. He neeeeeeeeded to know what was in that huge, 50kg bag in the broom closet. It was corn meal. Then he neeeeeeeeded to know if maybe there was something hidden in the corn meal. After getting it all out onto the kitchen floor he was satisfied that he hadn’t missed out on anything interesting. Small holes in upholstery held the promise of getting through to something more interesting inside the furniture so he would tentatively pick at them a bit. This would evolve into actually getting into position for better viewing and leverage. Then, when the hole was big enough, he would get right down to digging, tearing, removing fabric he saw no use for, etc. Bruce could find every single loose piece of parquet flooring. And remove it and its’ near neighbors. Bruce was also observant. He knew what item would get the biggest rise out of each of us when it was peed in or turffed out: pee down the hole in Josh’s guitar and in Caleb’s school hat, without which he would get a demerit. So many demerits and you got a caning. When I incurred his wrath he dumped all my African violets out of the pots and spread them around liberally. Once I had a wild bird I was nursing after hitting it with my car. I put it in a parrot cage on the dining room table. One morning I strolled into the dining room to find it sitting upon its’ perch…headless. Bruce had lured it over to the edge and decapitated it neatly leaving only a tiny little spine sticking up. Now I know it’s true that bird’s feet grip when they sleep…or die, apparently. Well, I could write a whole book about Bruce. Jon says I should. There is so much more to tell, but for now I will close. Next time I will try to convince you that he was lovable. Don’t get your hopes up. My stories aren’t as exciting as Jon’s. I am Cher, the Bush Pilot’s Wife. The first time we sat down in private to chat, Jon asked me how I would feel about being a missionary’s wife. I think I said that if that was what God wanted for me it was what I wanted as well. Whatever I said, it must have been the right answer because here I am, 38 years later, testing him out on his promise to “marry me and I’ll show you the world”! I am happy to say that he is doing well so far. We started out in Oregon, living in a tiny little old 1950’s trailer which we bought off the side of the road for $400. I can see it in my mind as clearly as I can the house we just left in Kampala 4 months ago! Since then we have lived in the US for awhile, for 2 years on Yap in Micronesia, 22 years in Zimbabwe and Mozambique, 4 years in Uganda and now in the Democratic Republic of Congo. While living in Yap we visited Jon’s family in the Philippines and on our trips to and from the USA we have traveled in Europe. Our work in Africa has also taken us to Zambia, Lesotho, Botswana, South Africa, Malawi, Tanzania and Kenya. But more than all the places, together we have learned to really see the world! And, oh, there is so much out there! Whole dramas are played out in tiny insect footprints in the dust. A huge, wrinkled whole-body print illustrates an elephant lying down against a sloping anthill. Here a snake has passed by. There a lion has left a pug mark in which I can lay my whole hand. From the air the Ituri Rain Forest looks like God’s broccoli patch. Cultivated land divided by hedges and thorn barriers looks like a stunning crazy quilt all done in “natural” colors. We peer down into steaming volcano craters and fly above mother whales, piggybacking their babies through shockingly blue tropical waters. And faces. Young, old, outrageously wrinkled (OK, that’s the mirror), smiling or recoiling in horror at our funny white faces, laughing at how we talk. Clothes that celebrate the best and brightest in the color palette. Fabrics sporting anything from chickens to Coca-Cola; envelopes, handprints, the faces of African leaders inevitably placed on ample backsides. Shoes made of tire tread with pointed toes that curl up and back like the footwear of Genie’s. In these pages I hope to give you a glimpse of the world through my eyes. Hi Cher, just loved reading about Bruce. I was at your house in Bulawayo in 95. Stayed over night, when I showered in the morning Bruce snuck into the bathroom. As I got out of the shower to dry myself off this little furry creature reared up took one look at me and started laughing. I almost felt violated. Great times. Keep writing. I love the way that you made your story mom ,now I start think of mine …. Love your Bob story! I need a bird that says “I love you, Lu”. Cher (and Jon) I spoke to you this morning at church in Eagle Point, Oregon .. I told Jon the other night that he needs to write a book about his work and the things he sees.. and he told me to talk to you that you were the writer.. I came home to read this blog and you have added some things and made it into a narrative style and have added some embellishments which really made the stories more interesting.. Jon wasn’t kidding you are a great writer.. keep up the good work… I was bemoaning my naughty little Maltese pups..that climb over gates to spread garbage all over the house and get their little monkey paws under the locked sliding door (locked with two hook type locks) and pulled out three afghan type baby blankets that are their bedtime blankets.. they had to have drug them under the door.. they opened a hook type lock on the linen closet in the bathroom and pulled out towels and dog blankets out into the middle of the bathroom floor and got them filthy right after I had washed and fabric softened them… like your little Bruce I guess they didn’t like the smell….. But …. I’m not sure I would have the patience to endure what you have with Bruce… you have the patience of a saint my dear.. and you are a fantastic writer.. I will be looking forward to reading more …will continue to keep you all in my prayers.. stay safe both of you..
Not sure if you will remember me, Jon you used to fly in supplies for us in the mid 80s in Mukosa during the Mozambique refugee crisis. 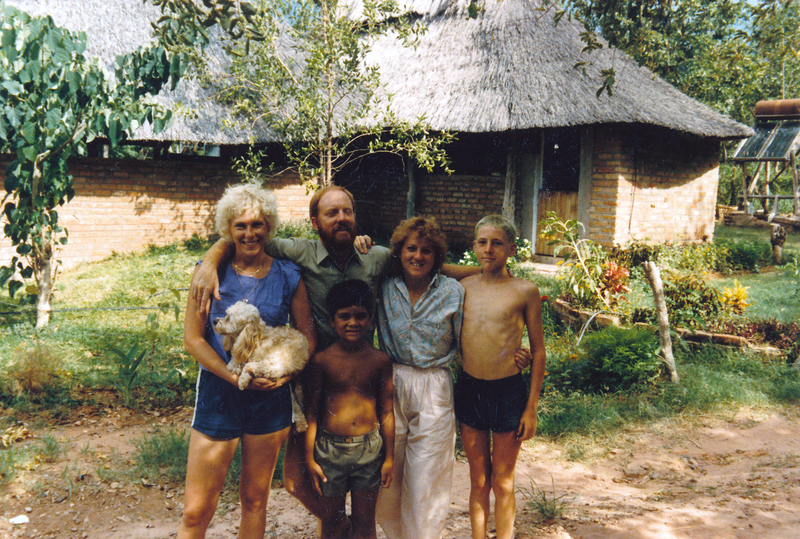 I had a YWAM team in Mukosa for a number of months. Cant believe its been that long. Sydney Moyo and I had been talking about buying Fothergill Island. Last time I was there Rob Finn owned it. I heard it was closed for a number of years. Sydney and I have been talking about purchasing it if it ever came up for sale. Decided to google it today and saw your blog. I have been flying for a couple of years now, always thought one day I will get my pilot’s license. Often think about you and Don Winters wondered what happened to you. Hope you are the same people I am thinking of. Would be great to hear from you if you ever get a chance. Hey Archie, Of course I remember you and that amazing time of our lives. Do you remember how we were landing on the road there at Mukosa and we had to land over the big baobab tree and up the stair step hill that teed into the minefield? Very exciting. I must write a story about that. With the Bus. Do you remember that. Who was the dutch girl nurse who was on the bus that day? Thanks for writing in. Good to hear you are flying. I will have to hear the story there and with Fothergill. I miss that place! Eish! Bruce stole my WHOLE chicken once! Hi The Cadds! No need to feel bad! Eish I enjoyed those days…borehole showers and T at 2…in the morning! Bruce and I got on fine once he discovered I could cook chicken. Hope you are both well and enjoying Congo. I spoke to Josh on skype the other day and he gave me this blog site. So cool to see! Glad that Bruce is still around… I remember all the wonderful times of laughter at your home in Zim when he would chase and break eggs in the kitchen just so he could eat. I thought he’d passed on, but obviously not. Hey I think you are equally talented in your writing. It made good reading. What wonderful Bruce stories! I am so very jealous. And 42 tortoises? Um, wow. Well, I had to share this with Brian since he actually knew Bruce… he laughed and told me that Bruce once bit him on the nose! I have many memories of Bruce, whom I ADORED, but they won’t necessarily sound like good memories. What I found fascinating were the wild animal traits that were instinctual, even though he had very little time in his early life to learn them from his mom: his instinctual fear of large birds of prey, the way he peed on his chicken bone to mark it before eating it, and peed in his bed to roll around in the smell before going to sleep. His acute sense of smell caused him to find some scents almost orgasmic, like the smell of Tiger Balm which sent him into a fit of writhing on the floor and then coming back for more. I loved his terrifying cackle when he thought you were going for his food. It scared the life out of me the first time I heard it. Even though none of this sounds endearing, it was. God only knows why. I think that WE have an instinctual desire to be one with wild animals, to have them as our friends. I’ve always wanted to “know” more about Bruce Mongoose. I told Jon I looked forward to a “book” and now I see it as a his view/her view story. Thank you for Who’s you are. Luv2U. You are a genius with words, Cher. Can’t wait for more! Great work Cher! Very descriptive and interesting. I agree with Helen, keep it up!